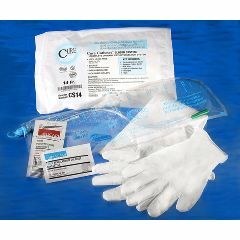 The Cure Medical Closed System Intermittent Catheters are DEHP and latex free. These sterile, single use, unisex systems feature polished eyelets on a straight, pre-lubricated catheter tip with integrated 1500 ml collection bag offered in singles and kit configurations. Last shipment from Allegro came in manufacture's box with catheter labels plastered all over the outside. If this happens again I will not order from your company again. Great to have when out in about. When out enjoying life.. Emergency. When out enjoying the world around me. these things are great for cathing on the run, so to speak. some times i use them at night instead of a regular cath and urinal but you have to watch out that the bag is lower than the insertion tip or the urine can leak out the top. otherwise a great product. Great to have everything you need! It's nice to have everything in one package! by Wolfman from San Antonio, TX. What is the difference in the $2.61 closed catheter kit vs the $4.95 kit. Is one better or easier to use?